Developed at Carnegie Mellon University. Trusted by 21 of the top 25 universities worldwide. Find out why Panopto is the leading video platform for higher ed. Why do 20 of the world’s top 25 universities choose Panopto for lecture capture and video management? It’s because no other video platform is as easy to administer, or as flexible for faculty. Best of all, with Panopto, the industry’s best-rated customer service comes standard with every license. Our team is ready to help with your initial implementation, training, ongoing technical support, and more. 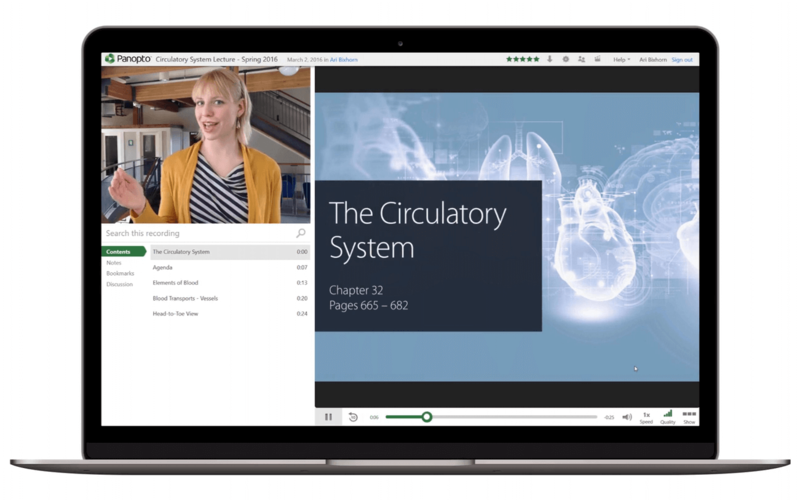 Centrally manage your recorded lectures, additional classroom videos, and even 3rd-party media assets in a secure, searchable video platform that integrates with your LMS. Reduce the cost and complexity of captioning videos. Panopto helps institutions achieve compliance with federal accessibility requirements for online video content with flexible captioning options, screen reader support, and more. From small departmental deployments to campus-wide installations, you won’t find an easier, more flexible lecture capture solution than Panopto. Enable faculty to record and share flipped classroom videos from anywhere, using any laptop, tablet, or smartphone. Record student presentations, assessments, and more. With private assignment folders for students, Panopto makes video easy to use for classroom assignments. Open more time for active learning, add new options for student activities, make course videos interactive, and bring more of the outside world into your classrooms with Panopto. Record lab demonstrations, patient role-play scenarios, mock courtroom trials, field demonstrations, and more, with Panopto’s multi-camera and mobile recording features. For administration, governance, athletics, alumni, and more, Panopto gives you new options for engaging with your community more effectively. Panopto enables students to personalize their learning experience, teachers to prioritize individuals, and primary and secondary schools to make classrooms more active. A few of our favorite posts from the teachers, students, and administrators who know Panopto best. JustanITGeek Really glad to be using @Panopto (again) at #USCofLaw. Heavily using it for Skills based courses here. Students seem to really like it. mediaguycouk Received a nice note today saying that Panopto recordings were supporting a student who can't yet return from the Caribbean due to Irma. jwadec . @elearningfeeds @Panopto is amazing! Our faculty absolutely love it! The OCR capture feature is impressive. JasonTurner00 @Panopto your support team is awesome, complete life saver. Great staff. GingerJames54 2X speed on Panopto is the greatest thing ever. Wojciethromycin I'm gonna say it again, thank god for Panopto! tylerclair Continually impressed by @panopto support. We've had some crazy requests and they have delivered. BW_on_eLearnin Winning @Panopto Spent over 3 hours over the phone helping get one of our instructors ready for fall qtr! Amazing customer service! rusalkat (psst, academia:) YOU GUYS. panopto is the COOLEST THING EVER. i'm geeking out entirely too much over this but AAHHHH. so much fun! Already using Tegrity, Kaltura, Echo360, Mediasite, or Yuja? Panopto makes switching affordable and easy, even if you're still under contract. Click here to find out more.